This study informs public policies regarding the use of subsidized loans as financial aid for community college students. Using logistic regression, it analyzes the National Center for Education Statistics’ Beginning Postsecondary Students (BPS 90/94) data to predict persistence to the second year of college and associate’s degree attainment over five years. During the period under study, loans did not contribute to higher persistence and attainment rates. Loans are observed to have a negative effect on persistence and no effect on degree attainment. Estimates of the interaction effects of borrowing and income status are insignificant but demonstrate the need for further testing. The findings are attributed to a combination of the high uncertainty of degree completion among community college students and the negative affective component of indebtedness. 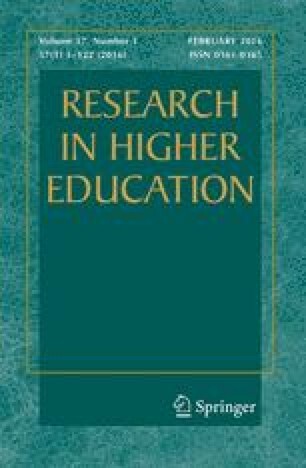 Earlier versions of this paper were presented at the American Education Finance Association Annual Meeting (Austin, Texas, March, 2000) and at the AIR Forum (Cincinnati, Ohio, May 2000). It has also appeared as a working paper of the Institute for Higher Education Law and Governance at the University of Houston, Texas (IHELG Monograph 01–07).This paper is based upon work supported by the Association for Institutional Research, the National Center for Education Statistics and the National Science Foundation under Association for Institutional Research Grant No. 99-128-0.